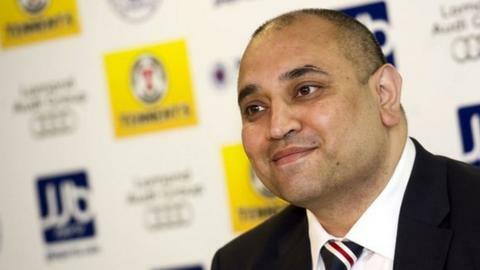 Former Rangers commercial director Imran Ahmad has been unsuccessful in his latest attempts to have £620,000 frozen in the club's account. Ahmad claims he is owed £500,000 in unpaid bonuses. But Lord Armstrong said: "There is some scope for concern about the financial position of the defender [Rangers]. "It cannot be said there is a real possibility of the defender being insolvent [in early 2015 when any potential liability would fall due]." At the Court of Session, Ahmad's QC Mr McBrearty pointed out the possibility that this year's sales could be badly dented by ongoing problems between the board and fans. However, key to Mr Summers' argument in defence of Rangers was that current institutional investors would provide further finance to stave off any prospect of an insolvency event, even if season ticket sales were to fall to a level that would cause financial difficulty. In February, Lord Tyre disagreed with Ahmad's claim that Rangers were trading while insolvent. Now, with doubts over season ticket sales, Ahmad was concerned about Rangers' ability to pay out should he win his ongoing legal battle with them. At the February hearing, Lord Tyre made his decision in Rangers' favour because of what he described as the cyclical nature of a football club's finances. Since then Rangers have made it clear that a significant drop in season ticket sales would leave them unable to trade without seeking external finance. The chairman of Rangers' football board, Sandy Easdale, also told BBC Scotland that the League One champions are in a "fragile situation". The implications of the decision going in Ahmad's favour could have been potentially devastating for the board. The Glasgow club declined to comment when contacted by BBC Scotland. After Tuesday's ruling, solicitors for Ahmad said in a statement: "In light of the recent developments at the club, particularly so far as season ticket renewals are concerned, our client remained reasonably apprehensive that Rangers may not be able to meet its obligations to him, in the event he succeeds in the current litigation. "Our client is content that the court recognised the public interest in bringing the application before it, in particular in refusing the club's motion for expenses."